So you have a tight budget, but you need something to set your TJ apart from all the other "wanna be wheelers" out there? Our Benchmark Series kit is a wise economical choice that still offers quality, value, and performance. The kit comes with everything you need and nothing you don't. The Benchmark Series is your ticket to entry level in suspension upgrades. In addition to being a complete kit in and of itself, it also sets the building blocks in place for future upgrades without using unnecessary parts that you'll end up discarding later. 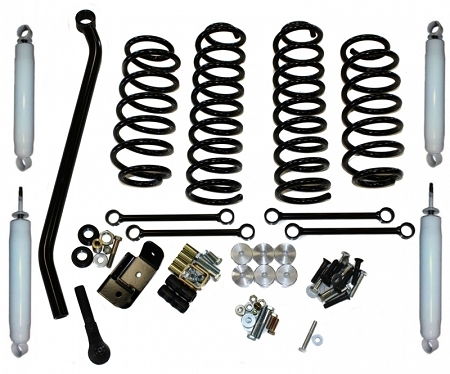 The Benchmark Series Kit uses all the same high quality components you'll find in the higher stages of suspension upgrades, so you'll never have to buy the same parts twice! We will only sell you what you want to buy, meaning, you can start with a kit that has all the necessary parts to achieve 3" of lift. Each kit is then fully customizable and upgradable for those of you looking for greater off-road performance. Don't let the price fool you! This kit is designed to WORK, both on and off road.